September 27th to October 2nd is Banned Book Week. There are not too many books about World War II for children and young people that have been banned but there are three – Anne Frank:The Diary of a Young Girl by Anne Frank was challenged as recently as 2010, while Slaughterhouse Five or the Children’s Crusade by Kurt Vonnegut and Summer of My German Summer by Bette Greene were among the top 100 banned/challenged books of 2000-2009. 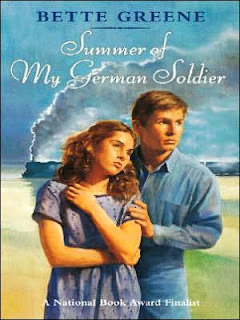 I had never read Summer of My German Soldier before now, though I did get an in depth description of it when my niece read it in middle school. It is the story of 12 year old Patty Bergen, a Jewish girl living in Jenkinsville, Arkansas. Her father owns a small department store there, and is helped out by her mother. Patty and her younger sister, Sharon, are cared for by Ruth, their black housekeeper. Patty is a lonely girl, who is constantly criticized by her mother and mistreated and physically abused by her father. She receives three severe beatings by him in the course of the novel. The story begins with the arrival of a trainload of German POWs, who are taken to a barracks outside of town to work in the fields. One day the prisoners are brought into the store to buy straw hats to wear while working. Patty is there and offers to help one of the prisoners buy some pencils, paper and a pencil sharpener. He tells her his name is Frederick Anton Reiker and she learns that he speaks flawless English because his mother was English and his father had studied in London. By the time the prisoners leave, Patty has developed a very serious crush on Anton. Not long after this, on the day that eight German saboteurs* are arrested by the FBI, Patty is sitting in her hideout above the garage, looking out the window when she notices something moving outside. Recognizing it to be Anton, she goes running after him and brings him back to her hideout. She brings him food and, since it is summer vacation and her parents don’t want her to hang out at the store, she spends her time getting to know Anton better. He is gentle, intelligent and witty, and fulfils a need in Patty, treating her with respect and kindness. But one evening, when her father sees her speaking to Freddy Dowd, a slow, poor boy she has been told to stay away from, her father beats her, first with his fists and then his leather belt. Seeing this, Anton starts to run out of the garage to stop the beating, but Patty yells for him to go away so her father won’t see him. Ruth, watching the beating from the house, sees Anton and the next day she persuades Patty to tell her who he is. Patty explains the situation and Ruth, who is Patty’s only ally at home, has Anton come into the house to eat the breakfast she prepared for him. Soon, however, it becomes clear that Anton must leave, that things are going to get dangerous now that the FBI is looking for him, believing he is part of the ring of saboteurs caught earlier. Patty gives Anton a clean monogrammed shirt she had given to the father for Father’s Day, a gift he had tossed aside. Before Anton leaves, he gives Patty a ring to remember him by, a meaningful ring which had been in his family for generations. And it is this shirt and ring that allows the FBI to connect Anton to Patty. Summer of My German Soldier is a quintessential coming of age story that also manages to realistically capture the feeling of fear and anxiety that people felt during the war. It also portrays racism in its various forms, racism directed at African-Americans in the Jim Crow south, and the wartime hated that could so easily spring up against Jews, Germans and Asians. In one example, Patty describes the way a Chinese merchant’s store was vandalized and he was effectively run out of town because the people didn’t know the difference between Japanese and Chinese. Greene also brings to light the kind of hypocrisy that is sometimes found in people who should be free of the kind of behavior. When the townspeople learn that Patty has helped a German POW, it is the minister’s wife who spits out “Jew Nazi-lover” at Patty as she is being escorted out of town by the FBI. This novel has also been challenged for being sexually explicit, something I seem to have missed, and for the language used in it. Both of these things seem to be standard fare of those who desire a book to be banned under the guise of protecting the young impressionable reader. 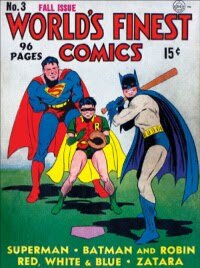 Additionally, the ending has been criticized for being too pessimistic and unsuitable for young readers. I found the story to be both believable and understandable in part because of the ending, although at times Patty did get under my skin. The hardest thing for me to read were the severe beatings she was given by her father, with noticeable marks on her body and, clearly, it was something he did frequently. I can only imagine how lonely and unloved Patty must have felt afterwards. Yet, no one stood up for her, except in the end the housekeeper Ruth, even at the cost of her job. It is always difficult to read about children being abused, in books and in reality. All in all, however, I am glad I finally got around to reading Summer of My German Soldier, and would not recommend others wait this long. Summer of My German Soldier was an ALA Notable Book, a New York Times Book of the Year (1973) and National Book Award Finalist. *The day was 27 June 1942 when eight German saboteurs were arrested. Four of them had arrived in U-boots on 13 June 1942 in Amagansett, Long Island and four arrived the same way on17 June 1942 in Ponte Verde, near Jacksonville, FL. They were carrying explosives and $150,000 for bribing people and their mission was to blow up military targets. For which age-group would you think this book would be a good read (considering the parts on beating and abuse)? Yes, I do know the book The Little Ships and enjoyed reading about it on your blog. I have a copy, but it is still a to be read book for me. Summer of My German Summer is definitely a YA book. I think it is too complex and graphic for younger readers. Great review! I'm going to have to grab a copy of this now and read it! Thanks for sharing it on Book Blogs! Glad you liked it, Suzanne. Really in-depth review. I've always heard good things about this book, but have never read it. May have to put it in the TBR pile. Thanks for stopping by my "Read My Reviw"! what does patty look like cause i have 2 do a book review ???? ?